In the last few years I have been introducing my couples clients to a therapeutic modality that first surprises them, and then almost instantly gives some relief to the stress and anguish they feel. This article will attempt to briefly summarize what it is. In any marriage there is a lot of learning to do, nor should we feel ashamed to be looking for couples therapy. 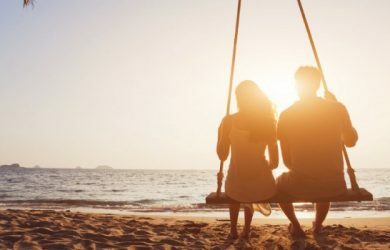 By the time a couple comes into conjoint therapy, there has usually been an ocean of tears, harsh words spoken, dreams dashed, and the amazingly painful realization that the person we fell in love with looks, sounds, and feels so very different from the one with whom we began our journey. Of course, most of us know now that our perceptions of each other change after the bloom are off the rose, and there is scientific validity to this fact. After a few years or even a few months, and the passionate phase of the relationship has run its course, even the levels of dopamine and oxytocin in our blood no longer spike to the same levels when we see our partners. The same thrill and excitement have evolved to a more sober, seasoned appreciation. Or it has devolved into stress, anger, and disappointment. So many therapists have observed, even though we know things change, we still carry a profound, unconscious mindset about our romantic lives, one destined to be disappointed. It is, in the simplest of terms, that our partner will magically make us feel better. Unfortunately or rather, fortunately! No partner can ever give us all of the loving kindness and healing we need. I say ‘fortunately’ because the marriage journey will yield unfathomable benefits if we only stop expecting them from our partner. When the inevitable, and often necessary conflicts and negotiations of modern couples life arise, this mindset of being aggrieved and resentful rears its head. We expect our loved one to fulfill many of our unconscious and unspoken longings. We hope against hope our partner will forgive us our own debts and faults, despite the fact we find it so hard to forgive them. What soon happens is that that scarce and precious resource kindness for ourselves is thrown into jeopardy. For real, how can we love ourselves if our very spouse is getting angry with us? This self-deprivation of an energy, an energy we desperately need, only leads to us feeling more defensive. And ill-treated, and judged, and more provoked to fight back harder. For a couples therapist, this is so heartbreaking, as we feel that these two perfectly good people sitting in front of us simply need not be so hard on each other. Sometimes I feel like I am watching scenes from Who’s Afraid of Virginia Woolf? Over the decades, couple after couple would come into my office, ready to blame each other. No matter what interventions I tried, it seemed like they were never going to forgive, nor let go of unrealistic hopes. Even when I exhorted them to put away their virtual knives, they still kept accusing and chiding. And I, as their therapist, would get exhausted witnessing the carnage. This particular approach, Buddhist in origins, introduces specific methods that enhance self-compassion and stimulate this latent faculty of consciousness. By giving clients a direct antidote to blame and anger, it helps to foster a non-aggressive style of communication, and can quickly interrupt the insidious, vicious circle of escalation. This is an urgent reality in today’s world, as so few of us were taught by our families of origin, church, or schools, how singularly vital it is to be kind to ourselves. We expect them to love us unconditionally. We blame them for not treating us fairly, or perfectly, or lovingly. We expect them to read our minds. Even when we know we are wrong, we expect them to be all forgiving. We expect them to assuage every sexual, gender identity, and performance insecurity. We expect them to be completely back us up when child raising. We expect them to run interference for us with their family, and our family. We expect them to inspire us creatively, intellectually. We expect them to provide financial or emotional security. We expect them to recognize our deepest spiritual longings and, as a wizard, help us on our hero’s quest. It’s a tall order, dealing with our partner’s subconscious, and to be on the receiving end of so many unrealistic expectations. And it is equally cumbersome to have those wishes ourselves. We all have a profound, unconscious desire to be cared for, loved, and respected in an absolute way. But unfortunately, no partner can ever give us this level of loving kindness and compassion, we can only do our relative best. These expectations become conflicts because, of course, they are not realistic, our partner has their own projections and ‘shoulds’, and a lot of this process is just fuel for the fire of frustration. Then, like some mythological beast, our blaming feeds on itself. To our lower ego blame feels good, and is compensatory. With my clients, I make the case that all of these expectations, in great part, are our own responsibility, and we are just frustrated because we don’t know how to begin to take care of our own needs. Dr. Kristin Neff, a professor at the University of Texas, Austin, recently published a ground-breaking book, called Self-Compassion, The Proven Power of Being Kind to Yourself. Her definition of self-compassion is three-fold, and calls for self-kindness, recognition of our common humanity, and mindfulness. She believes that all three work together in harmony to produce the actual experience. While at first glance it might seem like a superficial and obvious gloss, her work has now spawned over a hundred studies on the subject of self-compassion. Clearly social scientists in the West were, until recently, blithely ignoring the subject. Which is telling in itself. That our society is so dim on loving kindness for one’s self speaks to the severe and harsh judgements we have on ourselves and others. She goes on to observe that people who are kind to themselves are less judgmental, more accepting, more affectionate, and generally warmer and available to process issues that come up in the relationship. When we start becoming more compassionate to ourselves, then the more we can be kind to our partner, and this, in turn, creates a virtuous circle. By starting to be kind and loving to ourselves we reduce the expectations of our partner and start to feed and nourish the hunger inside ourselves for lasting peace, forgiveness, and wisdom. This, in turn, relaxes our partner for they no longer feel expected to wave a magic wand to heal us. The actual energy field of the relationship immediately becomes lighter because as we become kind to ourselves, we start feeling better, and we attract more positive energy from our partner. And as they feel better about themselves, then they have the more healing energy to give. It really just takes that a beginner’s mind, and a little initiative. Generating self-compassion will, like all compassion practices, lead to the rewiring of the brain’s neural networks, and awaken a latent faculty of consciousness. Of course, it takes some wisdom to know how to avoid narcissism, but for the basically healthy this is easy. The truth is that only we can really love ourselves in the way that we need, as we know ourselves best. Only we know intimately what we need. Moreover, we are the ones who torture ourselves the most, (leaving aside, for the moment, situations of abuse). When we introduce this reorientation of how to be emotionally, of how to stop the projections and expectations, and simply be kind to ourselves, it becomes more than just a reframe, it becomes a new way of relating to a romantic partner. And this new way of relating can, in turn, become a new way of life. Mark Glasgow Johnson, a licensed Marriage and Family Therapist, has been working with couples since his first clinical training in San Francisco. He attended the California Institute of Integral Studies, became licensed as an MFT in the 1990’s, and years later became certified as a Professional Coach. He is a member of the California Association of Marriage and Family Therapists and has been actively practicing meditation since the 1970’s. His main practice is Tibetan Buddhism. He currently lives and works in Charlottesville, VA, is happily married and a father of one. With his wife and a small group of friends, he is hoping to one day soon open a Sunday School for Contemplative Families in Charlottesville.